Chassis manufacturers are eager to add tempered glass and RGB lighting to their latest performance enclosures, but there's a lot to be said for keeping things simple. If bright lights and showy exteriors just aren't your cup of tea, there's a good chance you'll appreciate the design and inner workings of be quiet! 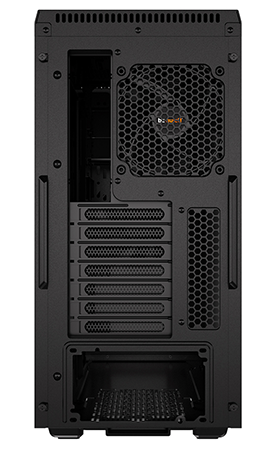 's latest mid-tower solution, the Pure Base 600. 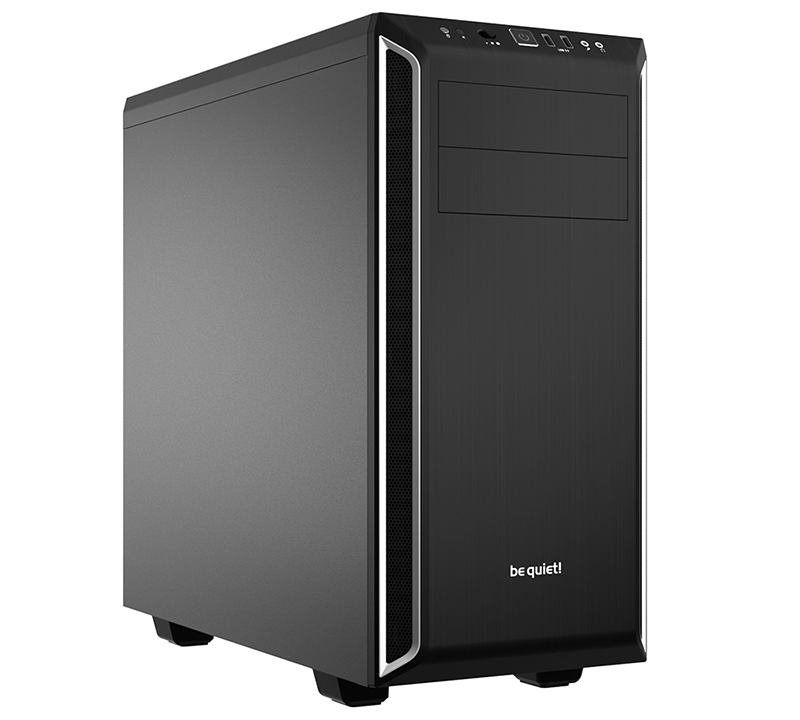 Priced at £75 and measuring 470mm (H) x 220mm (W) x 492mm (D) in size, this understated steel chassis is aimed squarely at those who build a PC to be a workhorse as opposed to a fashion statement. That isn't to say the Pure Base 600 isn't attractive, mind. The exterior simplicity gives it a smart overall appearance, and if the silver trim lining the front of our review sample is too ornate for your liking, rest assured there will be an all-black variant available at launch. 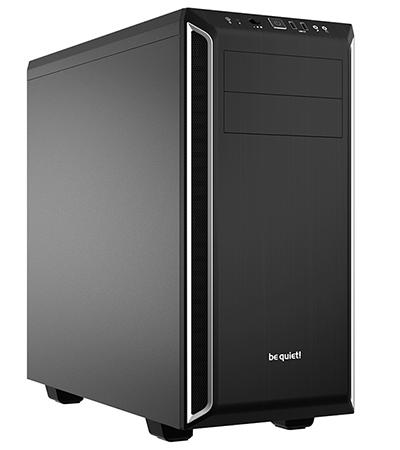 Build quality, as you'd expect from be quiet!, is good throughout, while the I/O ports - reset, fan speed, power, dual USB 3.0 and audio jacks - are right where we like them to be, angled along the top-front edge. The reset and backlit power buttons provide a satisfying click and the three-step fan-control switch works just as well, though it's a shame USB Type-C hasn't made the cut. 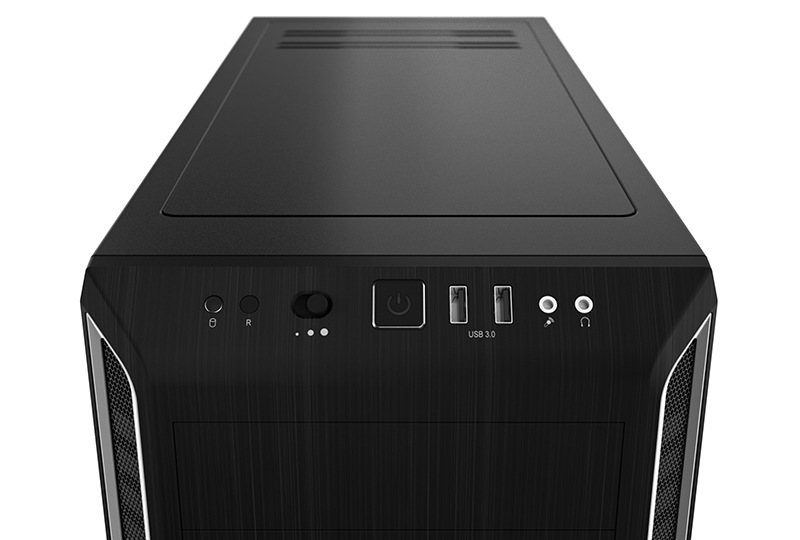 It has become fashionable to enclose the PSU bay and jettison the optical drives, but we're pleased to see the Pure Base 600 take a more traditional approach and not make changes for the sake of. As a result, everything is right where you'd expect it to be. 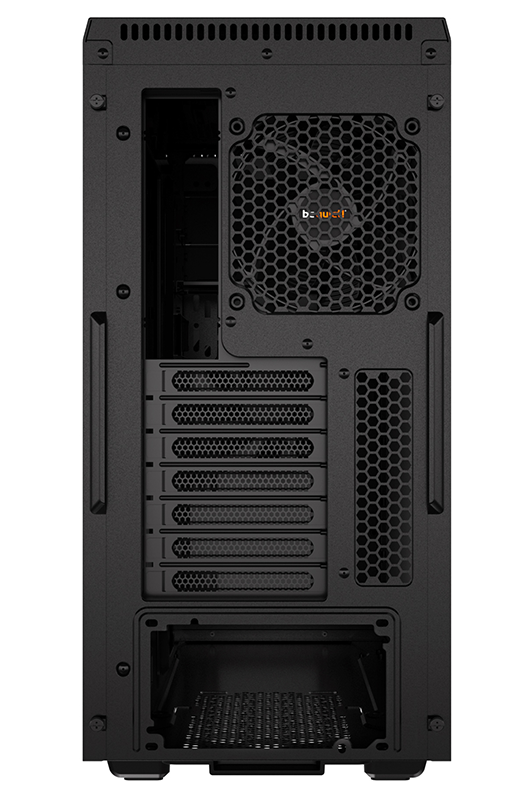 Pull-out dust filter beneath the PSU? Check. Trio of removable metal 3.5in drive trays? Check. Seven expansion slots? Check. Room for up to two 5.25in devices? Check. A pair of dedicated 2.5in SSD trays mounted to the rear of the motherboard tray? Check. Plenty of cable-routing holes? Check. be quiet! has all the essentials covered and adds a sprinkling of extra goodness in the form of sound-dampening material lining the top, front and sides, as well as a three-stage fan controller capable of handling a trio of three-pin fans. 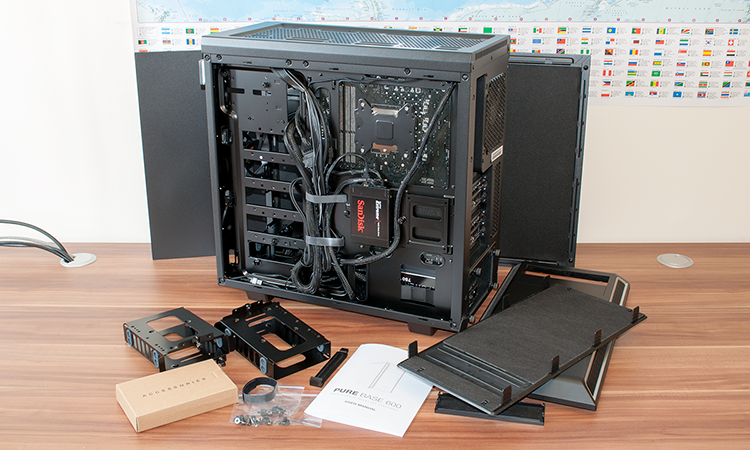 The German manufacturer is one to keep an eye on the finer details and ensures the fan controller is powered by SATA as opposed to Molex, which frustratingly is still in use in so many modern cases. A traditional interior makes the Pure Base 600 a cinch to work with, but at this price point be quiet! doesn't tick every available check box. The 5.25in optical bays, for example, aren't tool-free and, while it's of little consequence on a non-windowed case, builders who prioritise ultimate tidiness may lament the lack of rubber grommets on the cabling holes. What you do get is a pair of good-quality Pure Wings 2 fans; a 140mm front intake and a 120mm rear exhaust. Both are attached to the fan controller by default and there's ample room for expansion. 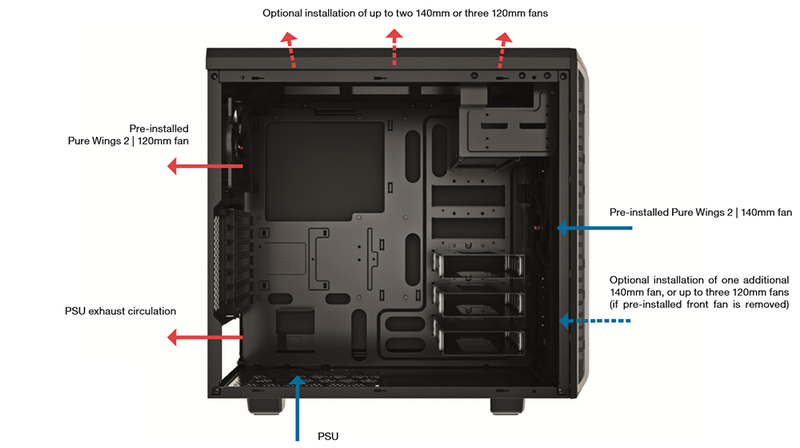 Choose to remove the optical cage and the front of the case can be home to three 120s or dual 140s, and there's room for the same arrangement in the roof. Airflow is ultimately limited to the slim mesh channels either side of the plastic front fascia, but there's a clever twist up top to help hot air escape. The plastic roof panel, lined with sound-dampening material, is attached via notched arms that allow the panel to sit flush or protrude slightly in order to aid cooling. Plastic clips make the adjustment process a bit fiddly, but it's not something you're likely to tweak on a regular basis. Our dual-GPU test platform went in with no fuss and there's good scope for high-end builds. 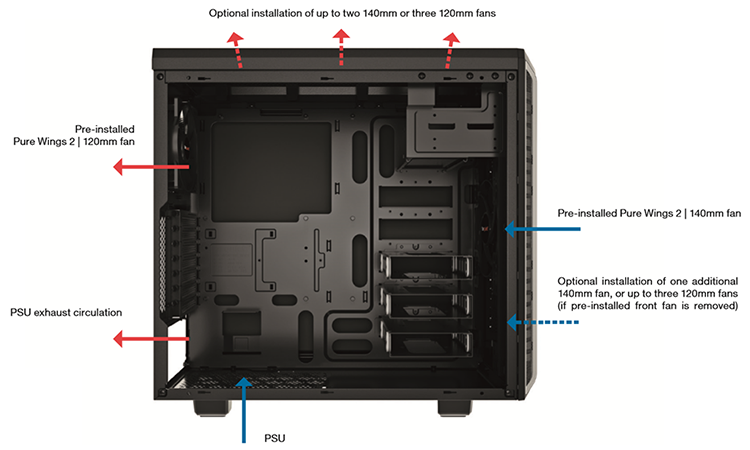 Pure Base 600 supports a CPU cooler standing up to 165mm tall, graphics cards can measure up to 280mm (or 450mm with the HDD trays removed/relocated), there's room for a 210mm PSU and, if needed, at least one good-sized radiator. 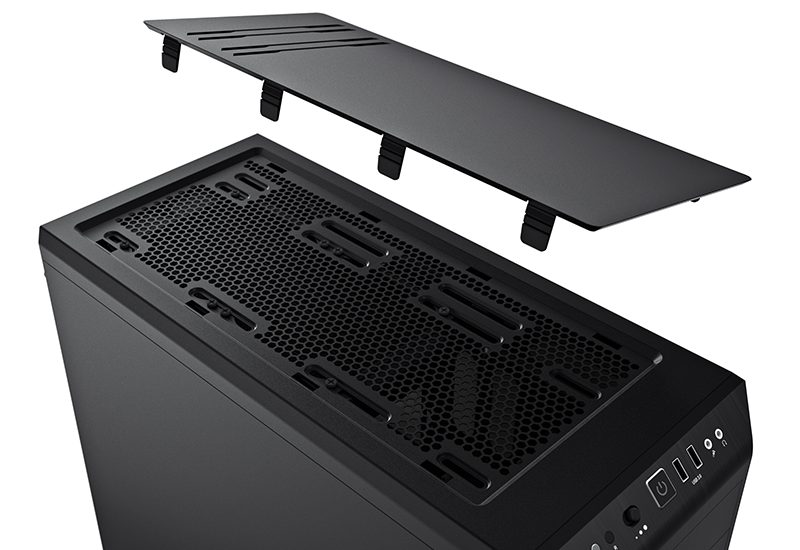 Notched side panels could have put a dampener on proceedings, but they too slot on with ease thanks to a reasonable amount of cable clearance behind the motherboard tray and plenty of tie-down points that work well with the supplied Velcro strips. In some ways a chassis, like a car, says a lot about its owner. I drive a reliable Honda Civic that has over 100,000 miles on the clock but is still going strong and the Pure Base 600 is my kind of chassis. Make of that what you will.